Vocabulary Puzzles are the latest line of teaching aids from Red Stick Teaching Materials. 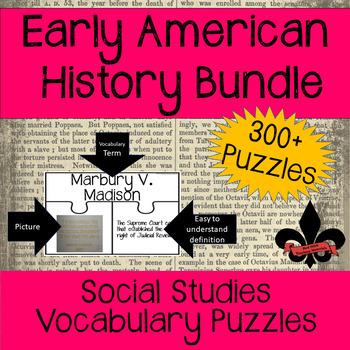 Puzzles will be available for topics in American History, World History, and Louisiana History. This set of Vocabulary Puzzles focuses on Early American History: The Colonies before the Revolution through Reconstruction. currentlyover 300 individual Vocabulary Puzzles formatted 2 per page.